Last week the Birmingham Civil Rights Institute (BCRI) withdrew it's annual Fred L. Shuttlesworth Human Rights Award from Angela Davis, in response to the outcry from some, including some within the Jewish community, on the grounds that she is an avowed supporter of the Boycott, Divestment, and Sanctions (BDS) movement and for equal rights for all people in Israel, Palestinians and Jews. Others opposed honoring Ms. Davis because of continued anti-communism. The outcry of outrage over this decision and the reaction in support of her has been enormous. Maurice Mitchell offers his commentary on the coordinated attack on Women of Color in general and Black women specifically on the left, of which the shameful attacks on Angela Davis is a part of. The response needs to be one of confronting these attacks on Black women, and Women of Color. Three members of the Board of the BCRI resigned, including Chair Mike Oatridge, First Vice Chair Walter Body and Secretary Janice Kelsey. Chair Mike Oatridge, First Vice Chair Walter Body and Secretary Janice Kelsey. An on-line statement of support by academics and activists from the civil rights and social justice movements has gathered hundreds of signatures, and will be released shortly. A letter signed by Jewish civil rights workers has been sent to both the Birmingham News and the Forward. A campaign launched by Jewish Voice for Peace - Stand with Angela Davis - in days has garnered nearly 18,000 signatures. You can add your name here. Last week Portside ran a number of posts about the action by the BCRI and the outcry and response. As a son of the south, specifically Alabama, I am saddened when a heroic daughter of the south, Angela Davis, is dishonored in such a public and shocking way. The cowardice of the board and leadership of the Birmingham Civil Rights Institute is especially repugnant because movement people here in Alabama know what Fred Shuttlesworth stood for. The museum and the Institute have become key parts of Alabama’s burgeoning civil rights tourism business. Those who insisted that the Shuttlesworth Award be taken away from Dr. Davis can’t have it both ways. Some backward white Alabamians hate Angela Davis because she fought segregation and racial inequality. They hated Rev. Shuttlesworth for the same reason. Others hate Angela Davis because she has been associated with the Communist Party. They hated Fred Shuttlesworth for the same reason. Angela Davis and Shuttlesworth both worked closely with the brave Jewish community locally and nationally during the early dangerous days of the civil right movement. Rev. Shuttlesworth was president of the Southern Conference Educational Fund during the fiercest days of red-baiting and he never flinched in his commitment to civil liberties. Dr. Martin Luther King, Jr., whose national holiday comes up this month, was called a communist by the Director of the FBI. Ms. Rosa Parks, Ms. Ella Baker, Anne Braden, Virginia Durr and many other daughters and sons of the south were also called communists. They would all, I am sure, support Palestinian self-determination. We saw Angela Davis and Ibram X. Kendi last night at City Arts and Lectures. Educational and Inspiring! This award is soo deserved, thanks B'ham City Council! She has been a life long activist for racial justice and equality, a global scholar and an insightful futurist. It was inspiring for the sold out audience including the many high school students. 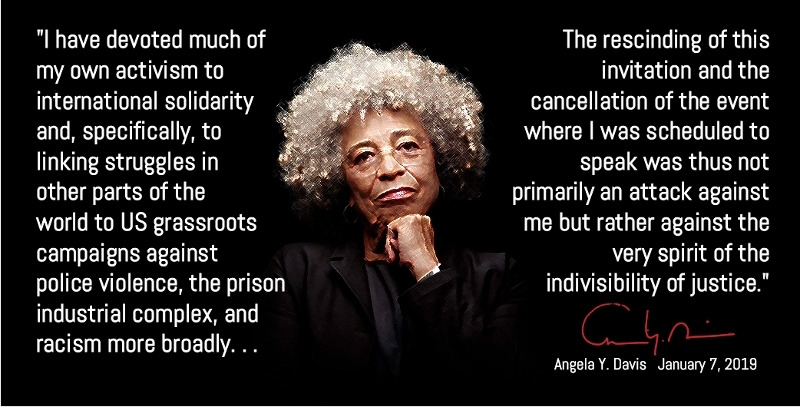 Thank you for a lifetime of courage and action, Dr. Angela Davis! According to some she had the audacity to speak up for human rights for the wrong people. The Jewish lobby has proven itself to be Isro-fascists. And what goes around, comes around. The Zionist lobby knows that BDS is hurting, just look at their reaction. 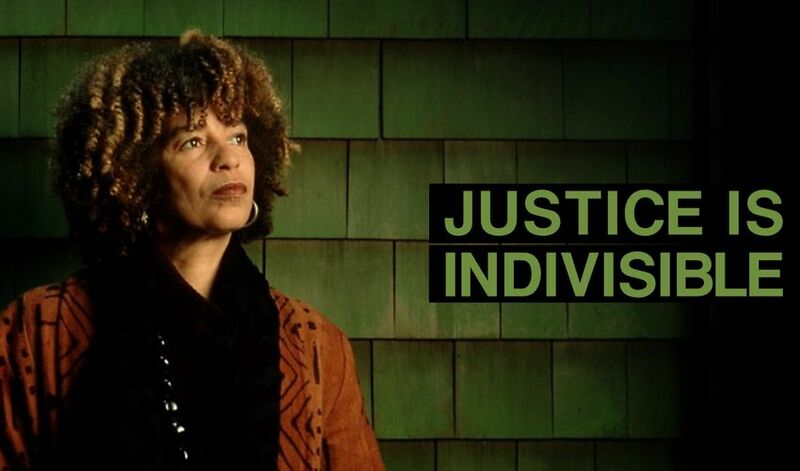 Partners for Progressive Israel strongly condemns the actions of the Birmingham Civil Rights Institute in rescinding its Fred Shuttlesworth Award to Dr. Angela Davis, apparently on the grounds that she is an avowed supporter of the Boycott, Divestment, and Sanctions (BDS) movement and an advocate of Palestinian causes. While it is not our business whom the Institute chooses to honor, it is very much our business that BDS is increasingly being portrayed as inherently antisemitic, and is increasingly used to tar numerous organizations and individuals who are exercising their constitutionally protected rights. Partners for Progressive Israel itself opposes BDS and supports the State of Israel. However, it is clear that most BDS proponents are opposed to Israel’s policies, not its existence, and that of those who are in fact anti-Zionist, few are in any way antisemitic. Partners opposes the dangerous and misleading attempts, all too common nowadays, to use those phrases interchangeably. Not only do such attempts inhibit basic First Amendment freedoms, they serve to create animosity towards Jews and Israel and misleadingly magnify the extent of opposition to Israel’s existence, thus exacerbating fear and hatred among Jews and in American society generally. Partners for Progressive Israel calls on all those, whether Jewish or not, and especially on lawmakers, to cease making BDS and Israel a political football. Both pro- and anti-BDS statements are fully protected under the US Constitution—and should be treated as legitimate policy statements. Hurling epithets and slurs at those who take one position or another on BDS, or penalizing them in whatever manner, takes us down a dangerous path away from a civil and workable democracy. I am a Jewish woman, a civil rights lawyer, and a former student of Angela Davis’s. Your decision to revoke Angela Davis’s invitation was a huge mistake. I have engaged with your Institute in my role with The Civil Rights and Restorative Justice Project, and had admiration for your work, which made this decision that much more shocking. Professor Davis taught me the importance of understanding the nuances of oppression and of liberation. She has shown the world what it looks like to advocate for the freedom of all people who face oppression. She is a strong ally of Jewish people and to the Jewish community. She understands anti-Semitism and speaks out against it. Revoking your decision to honor her is in itself misguided, but it did more damage than simply hurt an incredible woman who deserved the recognition. It is yet another example, of how anti-Semitism gets used as a wedge to divide people and movements. I am not going to wade into the waters of writing about Israel. But I want to emphasize that advocating for human rights of Palestinians is not anti-Semitic. There is a difference between critiquing acts of the Israeli government and being anti-Semitic. There are times when people act out anti-Semitism while critiquing the Israeli government, like circulating images of leaders of Israel with big hook noses or wholly leaving out of discussions the Christian Right’s investment and role in Israel. Again, there is an important distinction between criticizing the government and spitting hateful rhetoric about Jews as people discuss Israel and Palestine. Professor Davis understands that distinction. People are confused about what anti-Semitism is and how it functions, which is in part how people get manipulated to act it out, sometimes subconsciously. Anti-Semitism, hatred of Jewish people, exists throughout the world and it operates differently than other forms of oppression. It exists in the fabric of the United States— in the way Christianity is normal and anything else is other than. It lives in stereotypes about Jews, some of which get justified as alleged compliments when in fact they are dangerous. Jay-Z’s song, The Story of O.J. is a great example. He said, “You ever wonder why Jewish people own all the property in America? This is how they did it.” Stereotypes suggesting Jews control a large percentage of the wealth in the United States spreads inaccurate information about a group that many people know little about. These false notions paint Jews as a target to blame for class struggles, instead of focusing our attention on the white gentiles who possess the vast majority of the wealth in the United States. In my suburban high school in the Bay Area in California, people used the words gay and Jew interchangeably as an insult to mean uncool and weak. In Charlottesville, antisemitism manifested as chants of “Jews will not replace us.” Hatred for Jews resulted in the death of Jews at the Tree of Life Synagogue in Pittsburgh. Historically, we know, stereotypes and false messages about Jews supported an effort of attempted genocide. People who are racist and people who are anti-Semitic are usually on the same page: their goals to spread propaganda about people of color, Jews, and other groups are often in a smooth solidarity of hatred. In the era of Trump, we must unite rather than allow individual positions or misunderstandings to divide us. We can disagree on issues, but the solution shouldn’t be to revoke an invitation to a life-long inspirational Civil Rights leader like Angela Davis. We need her voice and her mind, and we need each other. “If they come for me in the morning, they will come for you in the night.”Angela Y. Davis In Solidarity, Kaylie This is a quote by Angela Davis rephrasing a letter from James Baldwin to her on November 19, 1970. There is a coordinated attack on Women of Color in general and Black women specifically on the left. The attacks are escalating but I’m unsure if we as a broad movement are assessing what is happening and responding in an equally coordinated and proportionate manner. From attacks against Maxine Waters over the past two years, to regular attacks against Linda Sarsour, Tamika Mallory, and Carmen Perez, the predictable attacks against BLM and the Movement for Black Lives (which are often gendered), the shameful attacks on Angela Davis, the spate of almost daily attacks against Alexandria Ocasio Cortez, Ilhan Omar, Rashida Tlaib, and other WOC freshman member’s of congress, and the recent attack on the Women's March through Meghan McCains transparent efforts – this is coordinated, strategic, and serious. These are not just attacks on these leaders as individuals, these are attacks on the broad left as a movement. And these are not isolated. The rationale may differ – the puritanical respectability politics weaponized via a fake controversy over the use of a curse word, dubious claims of antisemitism, bizarre dance-shaming, but there’s a common thread – these are all Women of Color advancing the left flank of the movement. The other commonality is they have all proven to be effective organizers. The responses, from my perspective, have been fragmented, reactionary, and at times defeatist. Many have remained silent, perhaps hoping they would avoid the heat. Some have relented, like the Democratic party and the Women's March this week. I think this is ill advised, cowardly, and ultimately self-defeating. Some have given these attacks credibility like those that have reprimanded Rep. Tlaib's comments against Trump. The right-wing is committed to defeating all of us, they are strategically targeting women of color in general and black women specifically because of their accurate assessment of misogyny, white-supremacy, anti-blackness, xenophobia, islamophobia and how they operate in our politics, our culture, and within the left. I’m afraid we may be suffering from a poor assessment of the damage these attacks are having on these brave leaders, some of whom I’m honored to call comrades and friends as well as the long-term damage on the left project. This is all happening at a time that requires sharp assessment and collective strategy from forces on the left that – although sometimes in competition – can recognize (i hope) the need to get in formation to take on a common enemy. There is a moral obligation we all should hold to support our folks – regardless of relatively small differences and a strategic obligation to defend the broader project we’ve dedicated our lives to. I fear if we don’t examine the way that internalized misogyny, white-supremacy and anti-blackness may cloud our assessments and strategy, we may lose. Furthermore, we must confront how individual and institutional lack of courage may play a role in effectively leaving our comrades on the battlefield when in the line of fire. Instead of our go-to being mounting collective defense the way the right-wing seems to perform masterfully. The Women’s March is coming up in a matter of days – we have an opportunity to anticipate the predictable right-wing attacks – seething with racism and misogyny. In fact, the Democrats seems to be predictably caving to faux right wing outrage leveled at Tamika Mallory. How will we respond? More is surely incoming. One suggestion is a shared common strategy that can be preemptively offered to allies, members of congress, and others that simply don't know how to respond. I'm sure there's a number of other good collective strategies we all can engage. I write this with all humility and curiosity and ultimately in the interest of our collective struggle.